Maintaining the right to be a Certified Public Accountant (CPA) requires all agents to continue their education and strengthen their skills. Because your title as CPA is esteemed audits are often performed in order to ensure you are on track with licensing requirements including being up to date with technical CPE courses. 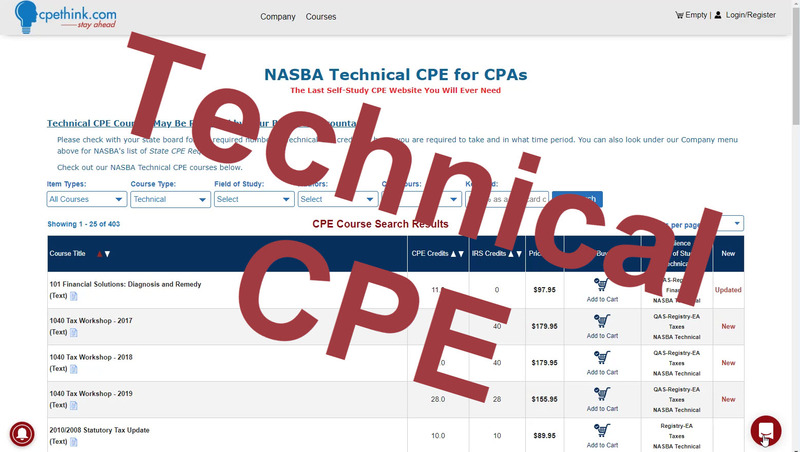 What are the Technical CPE Courses? Specialized industry or government practices with a focus on the maintenance and enhancement of the public accounting skills including the curriculum needed to competently practice public accounting. All licenses renewals and activations require technical CPE courses and we provide them all. To clarify, here is a list of NON-TECHNICAL CPE courses (though they are often still a part of your requirements, they are not listed as technical CPE). Our technical and non-technical CPE courses are approved under the American Institute of Certified Public Accountants (AICPA) and NASBA. Part of CPEThink’s mission is to help you stay ahead. We are incentivized by your success. The most effective way we ensure it is by offering you self-study technical CPE courses. This format guarantees unlimited access to the credits you need at the most competitive price. CPE self-study helps you maintain and stay up-to-date with your credit and licensing requirements. It also serves as a way to make sure you’re always on top of your education so that you are capable and ready to offer your services with a competitive edge. We provide the Continuing Professional Education that every CPA and IRS Enrolled Agent needs to satisfy their required technical education credits with their state board of accountancy or licensing agency and with the Internal Revenue Service. Explore the finance and online technical accounting courses that you need to fulfill your requirements with the all-inclusive accounting CPE courses for CPA’s CPEthink.com provides all the tools and resources you need to stay ahead. Download your online technical CPE course onto any device. We now offer technical CPE video courses! Combining decades of field expertise and modern technology, our qualified video technical CPE courses will prove to be the only online resource you’ll need in your CPA career without the boring graphs and cold classrooms. ... then this is the place for you. We are here to empower and educate CPA professionals just like you to stay ahead on your requirements, advanced in your education, and risk-free in your investment. Join us! Technical CPE Courses are needed or required by most state boards of accountancy, accounting boards or CPA licensing agencies. We have hundreds of technical CPE video and text based courses on Cpethink.com and are available 24/7/365. Please check what other customer are saying through our many reviews by verified customer that have purchased CPE courses from us at https://www.cpethink.com/cpe-reviews. Valid reviews are only allowed by customers that have purchased and completed a course on our site.